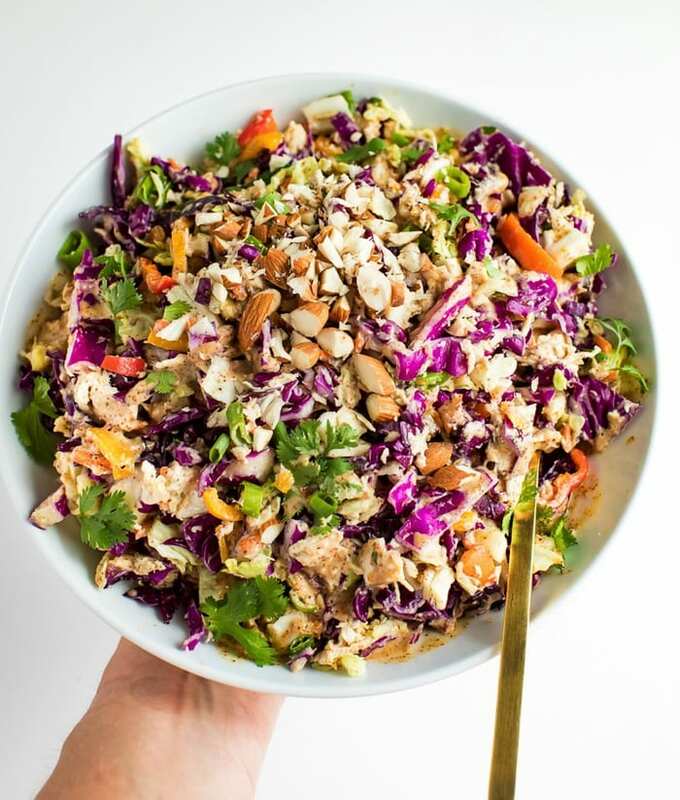 This Asian chopped salad is loaded with fresh veggies and tossed with a creamy almond dressing. You’ll love the crunch and flavor! Dairy-free, gluten-free, paleo and low-carb. 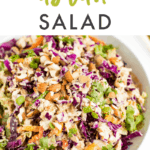 The reason my habit of having a daily salad (#saladeveryday) is so fun and easy is because I switch things up and keep my salads exciting. Don’t get me wrong, I definitely go in phases of loving certain salads. 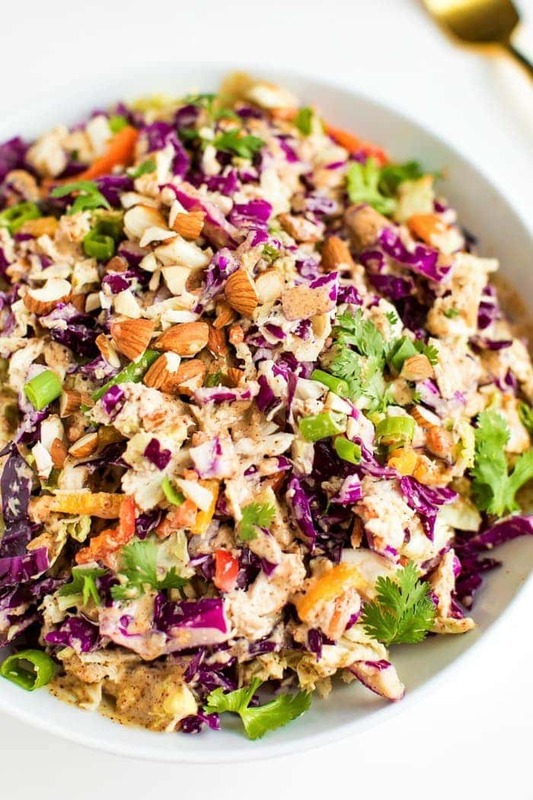 I was on a Cobb salad kick for a bit and now my new go-to is this Asian chopped salad. I feel like whenever I create a new salad I eat it every day for a week or two and then get the itch for change so I create another combo. 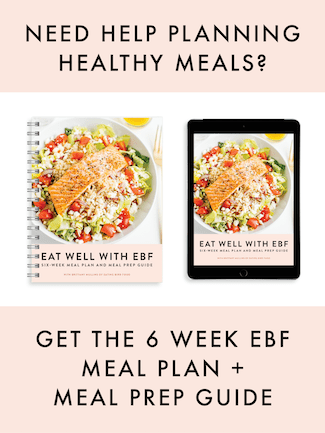 Are you a meal repeater? Or do you like to keep things fresh and new every day? 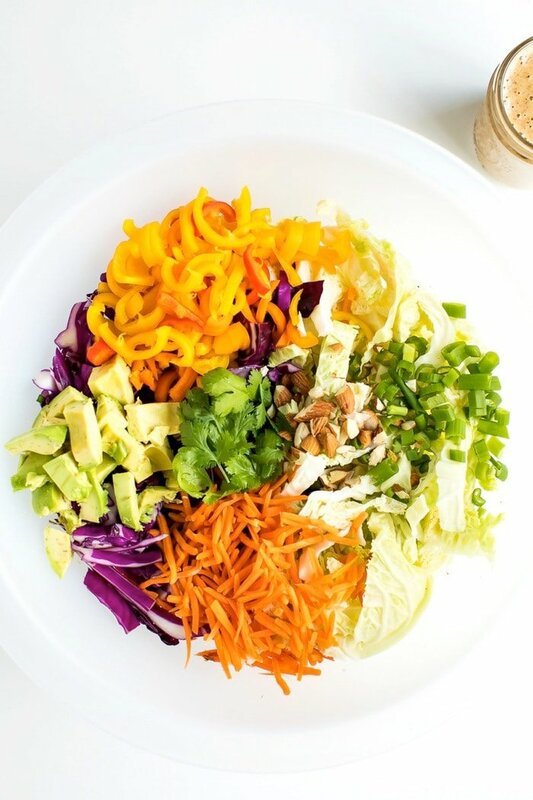 The veggies in this salad are great (so crunchy), but the real star is the chili almond dressing! It’s amazingly creamy and is legit giving me life right now. I’ve been drizzling it on everything! And the base of this salad is cabbage. Both napa and purple cabbage have a lot of great health benefits, but I’m going to focus on purple because that’s the real nutrition powerhouse! Packed with Vitamin C — as in, more than oranges! Vitamin C helps boost your immune system and repair tissues in your body. Anti-inflammatory, which means it helps fight inflammation throughout the body. Inflammation shows up in our body in so many different ways – IBS, acne, pain – the list could go on! Loaded with Vitamin K which helps with a variety of body functions — everything from blood clotting to bone health. High in antioxidants. You’ve probably heard that term but what does it mean? Have you heard of free radicals? They are the same as oxidative damage or stress in the body. Antioxidants combat those free radicals which essentially counteracts the damage happening in our bodies. Important stuff! On the Environmental Working Group Clean 15 list — meaning it is one of the lowest fruits and vegetables with pesticide residue. Woo! Back to this delicious salad… I used my beloved OXO salad chopper bowl to chop everything which made this ridiculously quick and easy to make. You can just throw all the ingredients in the bowl, chop and mix! You certainly don’t need the salad chopper but it makes this salad super easy to toss together and is probably my favorite salad accessory. 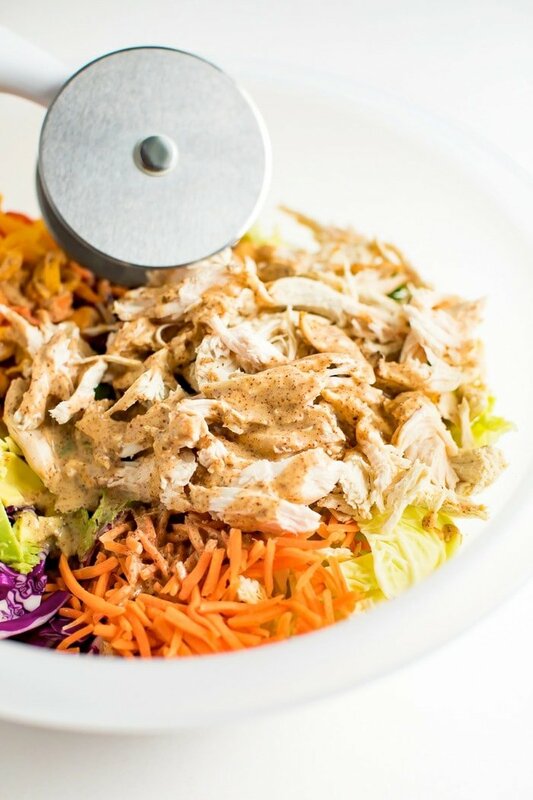 😉 So many people have told me they bought the salad chopper because I recommended it and their lives have been forever changed… just sayin’! 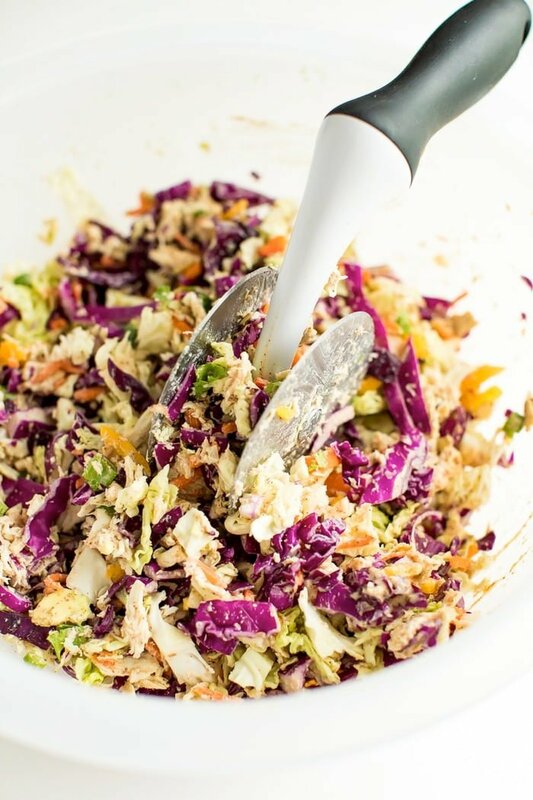 Toss cabbage, carrots, bell pepper, green onions, cilantro and shredded chicken in a large salad bowl or the salad chopper bowl. Toss with dressing to taste. Portion salad on a plate. Top with sliced avocado and chopped almonds. 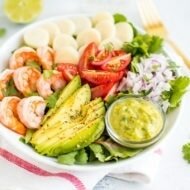 If you’re making this as a meal prep salad I recommend adding some dressing to the full batch but saving some to add just before serving as well. The cabbage doesn’t get soggy but you lose a little flavor from the dressing as it sits so I like to add a drizzle when I serve it. I also recommend adding the avocado right before serving. 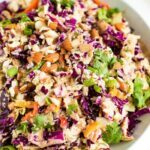 If you try this Asian chopped salad I’d love to hear what you think. Please leave a comment with your feedback and give the recipe a star rating! Oh Brittany- this is a keeper! I haven’t made it yet. When I go shopping, I will buy some fresh cilantro, and Napa cabbage. This bad boy is mine!!! Thank you Brittany, for your work from which we benefit so yummm-ily! 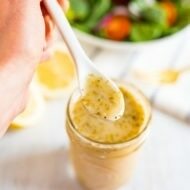 Ahh I was thinking that dressing would be perfect for a salad with cabbage! So excited about that crunchy texture…plus this would hold up well for meal prep! (Minus the avocado). 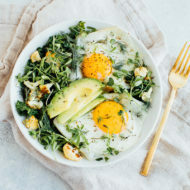 This salad works perfect! I need to bite the bullet and get that salad chopper. I told my husband I wanted one for Mother’s Day. He got something totally different (even though this one was in the save for later section on our Amazon account)? The salad makes a big portion and should make about 3-4 meal-sized servings. I love making it at the beginning of the week as a meal prep salad. Hi I just made this recipe today and I can definitely recommend it to anyone. Delicious.